The US and Turkey agreed to continue pursuing mutual interest in expanding trade between the two countries, the White House said on Sunday. 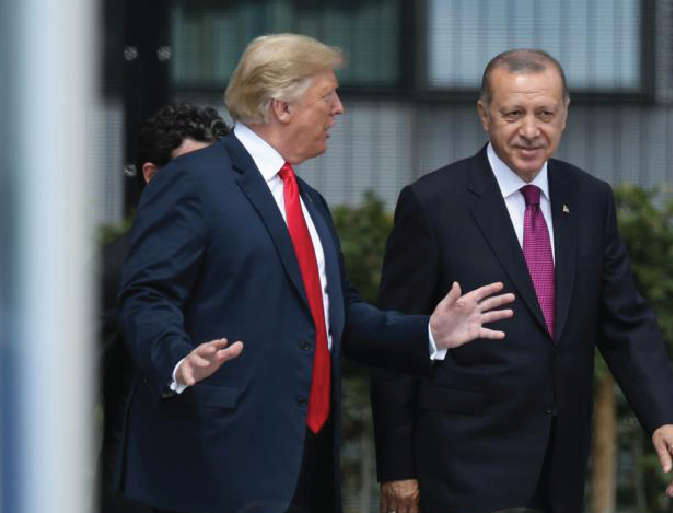 Hopes to develop ties between the allies were expressed in a phone call with Turkish President Tayyip Erdogan and President Donald Trump on Sunday. Both leaders also discussed a negotiated settlement for northeastern Syria that meets both countries' security needs. Tensions have been high between the US and Turkey over the fate of Washington's Syrian Kurdish allies in the fight against the Islamic State group. The Kurdish People's Protection Units (YPG) are considered to be a "terrorist offshoot" of the outlawed Kurdistan Workers' Party (PKK). They form the bulk of fighters in the Syrian Democratic Forces (SDF) - a coalition of Arab-Kurdish fighters taking part in a US-led operation against the Islamic State group. Manbij - controlled by Kurdish fighters and supported by the US military - had been hit on Wednesday by an attack claimed by the Islamic State group (IS) which killed 19 people, including four Americans. In their second phone conversation in less than a week, Erdogan told Trump that this attack was a "provocation" aiming to impact the decision to withdraw US troops from Syria, the state news agency Anadolu reported. Turkey has been threatening for months to launch an offensive in Manbij to drive out the militia of the Kurdish People's Protection Units (YPG). The YPG, however, has been backed by the US in the fight against the IS jihadis. But Ankara doesn't want to see installed along its border an embryonic Kurdish state which might reinforce the PKK separatists inside Turkey. To lower tensions, Turkey and the US last May agreed a road map including the withdrawal of the YPG from Manbij and installing joint Turkish-American patrols, which began in November. The two NATO allies are also looking to create a "security zone" aiming to separate the territories held by the YPG from the Turkish border. Erdogan and Trump on Sunday agreed to speed up the discussions under way between generals of both countries to establish this zone, Anadolu said.